Hubert Gough, a cavalry officer, led a division of the British Expeditionary Force on the Western Front during 1914 and 1915. He became a corps commander early in 1916 and took part in the Battle of the Somme and the offensives at Arras and Ypres. 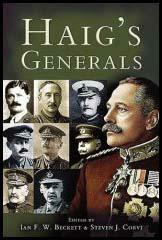 Commander-in-Chief, Sir Douglas Haig, regarded Gough as one of his best officers, but he was severely criticised by others for his over-confident offensive enthusiasm and his belief in cavalry attacks. Gough was blamed for the Fifth Army's collapse during the German Offensive in March 1918. Replaced by General Sir William Birdwood, Gough did not hold command again until after the war. Gough was highly critical of the Versailles Treaty and was an active member of the Union of Democratic Control. Sir Hubert Gough died in 1963. It seems to me that the Peace Treaty can be viewed from two points of view, the moral and the purely utilitarian. From either it appears thoroughly bad, and it has failed and must continue to fail to reach any good result, such as all who fought in the war supposed we were to gain. We hoped to establish justice, fair-dealing between nations, and the honest keeping of promises; we thought to establish a good and lasting peace which would, of necessity, have been established on good will. The Peace Treaty has done nothing of the kind.